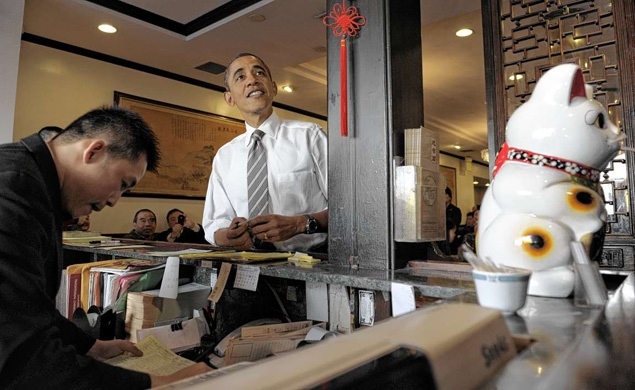 Earlier this week President Obama took a seemingly apolitical lunch stop for Chinese takeout at the famous Great Eastern Restaurant in San Francisco’s Chinatown. For ocean activists this stop prompted an occasion to highlight the issue of shark finning, a process where sharks are caught solely to remove their fins and their finless bodies are dumped back in the sea. The media likely got tipped off from the many ocean advocates working to end this brutal practice that the Great Eastern serves a $48 bowl of braised shark fin soup. Although Obama did not indulge in the Chinese delicacy, the San Francisco Chronicle and NY Daily News took the bait and put shark finning, and the ease of finding the fin soup, in the national spotlight. In Jan 2011, Obama signed the Shark Conservation Act, which strengthens existing laws banning fishing for sharks’ fins. A law banning the sale of shark fins also went into effect in California in 2011. It’s great to see sharks get some attention on the Obama campaign trail and I hope more ocean issues get trusted in the national spotlight during this campaign year. The National Ocean Policy is under attack by Republican-controlled House National Resources Committee. Remember, Mitt Romney initiated the Massachusetts ocean planning initiative, which is now a model for the national marine spatial planning initiatives laid out in the National Ocean Policy. Perhaps Romney needs to be reminded that he supported healthy oceans in Massachusetts before he was against it.